I want to know about any experiences people have had from Earthing/grounding? I have been reading up on it to some depth and want to know if anyone has had any positive results? Please do not fail to consider NEGATIVE results. could you give a brief description of what earthing or grounding is? Hello Amy good question but I am a bit confused. In my experience everyone is grounded to a certain degree due to the fact our bodies are of Earth. you asked what experiences have people had from Earthing or grounding. But I believe everyone is connected both to the Earth and the universe as humans. Are you meaning to ask about intense grounding and earthing to the extent that the individual cuts off their connection to the universe ? Sir what the negative , unwanted physical , emotional, psychological synonyms we get when not properly grounded or earthed ? In answer to the various aspects raised in your posts to this thread, I have brought together a composite of my personal learning over many decades. I realise it is lengthy and complex, however, it is my hope that you each will find some helpful explanation. I respectfully suggest that you download or copy and paste this perhaps to a Word Document, and give it some attention, progressively over the future. I will be most pleased to read comments arising, as they will, undoubtedly assist and guide me in my own developing understanding. The answer to the basic question is buried somewhere below, in an item indicated with a red 7. When, in the early 1990s, I first heard other people speak about 'you must ground yourself' before and, especially, after meditation or other energy practises, I was puzzled. I propose that between 80% and 90% of the present population of the western hemisphere of planet Earth, would not understand those first two sentences. The establishing of power/control/dogma-based socio-religious civilisations over millennia has largely obfuscated or obliterated the true human function. Therein lies the basis of humans' disconnection from, and failure to understand, the true purpose of his presence here in the third dimension. The precept on which I base my comments is that the whole of Creation, regardless of how many universes exist, whether concentrically, in parallel, or in any other relationship to each other in space/time, ALL is in a state of progressive evolutionary development in perpetuity. We humans, in repetitive incarnation over multiple millennia, carry an onerous responsibility. It is our function to facilitate, even expedite, the evolution of this planet Earth. RACE ON A SPIRITUAL LEVEL, as the conduit for channelling cosmic energy to Planet Earth so that, in conjunction with Earth’s inherent telluric energy, the Evolution of Planet and Race can continue to occur concurrently on a profound spiritual level. At present this is somewhat out of kilter because of the various astrological phenomena, including ‘precession.’ Simplified, this relates to the ‘wobble’ of the Earth on its axis as it moves through the solar system and the Milky Way Galaxy, within the Universe. This influences the impact of cosmic energy from the centre of the galaxy on all the various galactic bodies, including Earth. At present, we are just past our furthest point in a 25,920 years’ cycle; as we continue in this complex orbit we will feel more and more, the effects of the vibratory increase resulting from our progressively increasing proximity to the Galactic Energy Source. (which is, itself, a derivative of the ultimate Creation Source.) This will contribute to the progressive re-awakening of conscious spiritual awareness within the human race. This, in turn, is what will most influence the spiritual evolution of Planet Earth. Evolutionary progress of this kind is occurring throughout the Universe, (and, undoubtedly, other Universes) but what makes ours so special is that this Planet Earth is the only planet where we, the human race, are given freedom of choice as to whether or not we engage in this function. Other entities, beings, energy forms, within the third dimensional spectrum are subject to the natural laws of their existential status. LINKING OUR CONSCIOUS MENTAL AWARENESS TO OUR SPIRITUAL FUNCTION IS, BASICALLY, CREATIVE VISUALISATION. THIS IS BEST AND MOST EASILY ACHIEVED IN A STATE OF MEDITATION WITH PRE-CONCEIVED INTENT. SEE ITEM 7 BELOW. 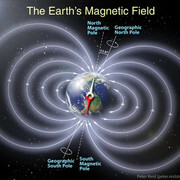 The geomagnetic field of our Planet extends from within its physical sphere, out into space, where it meets the solar breeze at an altitude of some six thousand two hundred miles [10,000 km] For our purposes we need not be concerned with other functions that concurrently transpire within that dimensionality, since these are handled by higher level beings as described below. 1 Visualise Planet Earth, its axis slightly tilted in relation to the line of its solar orbit, enclosed within the geomagnetic field before described, caressed by its enveloping solar breeze. 2 Extend the line of the planetary axis both northerly and southerly until that line intersects the envisioned spherical boundary between space and solar breeze. Mark those two points of intersection. The distance between the two points is some 20,317 miles [32,742 km] which is relatively unimportant to our purpose but enables intellectual conception of the relative spatial dimension of the current task. We will now visualisationally construct, at this spherical level, a complex energy pattern using each of those two points as an intersectional datum for a series of energy lines which, whilst not directly penetrating the envisaged volume, will nevertheless, energetically impact that volume, enabling the appointed-energy-manipulation-functionaries [operating at higher vibratory frequencies,] so to utilise the strengthened framework as to repair and revitalise the currently damaged and malfunctioning aspects of the aforesaid geomagnetic field. 4 It is the role of earth-borne energy manipulators to engage in maintenance of the above-described energy structure. There follows at 7, a description of the manner in which this is performed. 5 It is the role of the previously-mentioned, appointed-energy-manipulation-functionaries [operating at higher vibratory frequencies,] to transform the energy so-delivered to the higher frequencies appropriate to the purpose of maintaining the higher frequency aspects of the great sphere and the geomagnetic fields contained therein. 6 The source of the energy filtrated into the above-described matrix lies within the Milky Way Galactic core. The manner of its delivery into individual planetary energy fields is by action of the, in this case, earth-borne energy manipulators. The physical comportment of the human body during the process is of comparative unimportance, whereas the fitness and nourishment is, and it is the responsibility of the individual to manage this for optimal efficiency. 7 Ideally, the chakra system should be monitored and activated. Grounding of the energy is from the base chakra via the brown Earth Chakra [immediately below the red Base Chakra] and into the Earth’s telluric energy flow and associated distribution network. Complicit with this, ground also the six minor chakras located in pairs a) at the groin or gonad, b) behind each knee c) beneath the sole of each foot. These are supplementary earthing or grounding paths for additional stability during transiting of stronger energy streams. When activating the chakras, it is desirable to visualise their opening in pairs; base/red with crown/violet, sacral/orange with brow/indigo (or amethyst), plexus/yellow with throat/blue, and lastly heart/green. At this level of activation, the colours can be seen flowing and counter-flowing, intermingling [but not intermixing] within the auric field. Visualise the stream of Cosmic Energy entering your energy field at the crown chakra, flowing down through the auric field (where a measure of processing occurs) exiting via base chakra and earth chakra into the Earth’s core. Here, the Elemental Spirits of Earth, Water, Fire and Air take over and the energy is directed by them to the axis, and projected via the north and south points of the 20,317 miles [32,742 km] long axial line where the appointed-energy-manipulation-functionaries [operating at higher vibratory frequencies,] complete the operation of integrating the energy into the Earth’s geomagnetic field. This diagram represents the description in the opening para plus point 1. Sorry I am unable to post image larger. You can find it by Googling Earth's geomagnetic field. These points of intersection described in point 2. cannot be indicated in two-dimensional format. The construction detailed in point 3 cannot be indicated in two-dimensional format since it exists only visualisationally as energetic form. Thank you for your explanation Sir. I will go over it more thoroughly when time allows. (02-24-2018, 08:44 AM)Rajesh Rai Wrote: Sir what the negative , unwanted physical , emotional, psychological synonyms we get when not properly grounded or earthed ? Please bear with me Rajesh. I will come back to your question later. Was aware of term Grounding for about 30 years. Which was part of various energy healing modalities, as a process of feeling connected to the Earth and it’s energies. Becoming Grounded on and to the Earth. Had never heard of term Earthing before, so had to look that one up. Seems to be connected with feeling connected to the Earth energies also both physical and ethericly ( life prana) and specifically by walking barefoot in nature or exposing one’s physical skin to the earth and consciously or even unconsciously taking in the Earth’s natural pranic life forces. A process which ancient Native and Shamanic cultures and also in Tai Chi, Yoga etc. where well aware of and used in healing and restorative properties for thousands of years. Likewise it is connected to Ideas that the Earth itself is a living evolving Being ( Gaia) with Intelligent forces overseeing it’s evolution.. and the background energy field of everybody living on the earth- each effecting each other within the domain of natural Cosmic laws. Both positively or challengingly. I am well aware of the earth energies being connected also to Kundalini forces within the human Energy fields, the dual etheric nervous system and it’s chakra connections. Thank you Moonbear for your informative insight about some of Earth energy layout and its connection to energy of the chakras on your earlier post here. It is a process which fits in very well with the Saturn in Capricorn energy humanity will be going through for the next 2 1/2 years. It is connected to the symbolic and energy behind the symbolic connection to the Element of Earth.